So, I’m one month in, and things are going pretty durned good. The constant soreness is largely gone, at least in intensity. I’m not pain-free, though. I’m trying to practice ahimsa, or the 5th, “non-harming” yama (restraint or behaviour), but that’s hard to do when your wrist has decided it hates you and will demonstrate that by producing a repetitive strain injury. Awesome. Apparently, I’ll be teaching a class this next month. I am somewhat concerned about this prospect, as I: a) cannot remember the posture names, b) have some difficulty remembering the order of events (totally forgot the entire standing balance series in Thursday’s Mysore class), and c) don’t feel much like a yoga teacher yet. I feel like apologizing to the poor sods who wind up in my practicum classes. Luckily, they don’t read this, so I doubt they’re worried about their impending yogic liability. I hope Jenni’s got good insurance. On that optimistic note, I’m off to bed, because Sunday class is bright and early. And extremely sweaty. It’s proven to be the sweatiest time in my life, these Sunday primary series classes. It IS damp in there. Yeah, okay, so I have not kept up my end of the bargain. But, to be fair, your end is pretty light on the commitment side, as in, you needn’t do much at all. So, it’s kind of fair. Plus, the reason I didn’t blog is because my arms were too darn sore to type. Seriously. Ashtanga yoga is traditionally a 6-day practice. Which means that Bay is a pretty sore little yogi. I’ve been doing Mysore classes, which are basically self-led Primary Series, er-lie in the morning. They’re actually pretty awesome. Although, not gonna lie, it can be easy to perhaps cut yourself a little slack. In all of my led classes, however, I am amazed by the amount of sweat one body can create. Multiply that by, oh, 18 people, and you have got yourself one very sweaty, humid and stinky room. It’s not pretty. I’m actually past being surprised at how much moisture I can produce in a class, from previously-thought-to-be-sweat-gland-free body parts, such as my shoulders. In other news, my knees have decided they don’t like lotus position, which I used to avoid because of my bum ankle. Turns out, my ankle’s fine, but my knees react to the added pressure by preparing to launch my patella into the ether. Patella and Ether are words I have learned in YTT. Speaking of words, I’m having a tough time learning the Sanskrit pose names. They are long, not intuitively obvious, as my stats prof would say, and they seem remarkably similar to one another. I have a plan, involving a lot of writing and rote memorization. Fun times ahead, ahoy hoy. Okay, so I have been a somewhat absent blogger. I get it and I feel terrible. My bad. But, in my defense, you wouldn’t have wanted to read what I’d have been writing. I was wallowing in a hefty pit of self-pity and despair. It wasn’t pretty. So, that’s the excuse. You’re welcome. As for now, well, I’m all started up in yoga teacher training. YTT. Until Christmas, I’mma be downward dogging, ohm-ing and breathing. Lucky for you, I’ll be filling you in as I go along. Based on the first week, I anticipate this will be amusing. So namasté and I’ll see you soon. 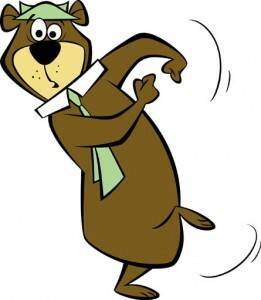 This is not the yogi I intend to become.